Developers Compulsion Games have today announced that the new indie survival horror game We Happy Few, will be officially launching next year on April 13th 2018. Watch the official announcement trailer below to learn more about the new hoot game that will be available to play on Xbox One, PlayStation 4 and PC and has been built using Unreal Engine 4. 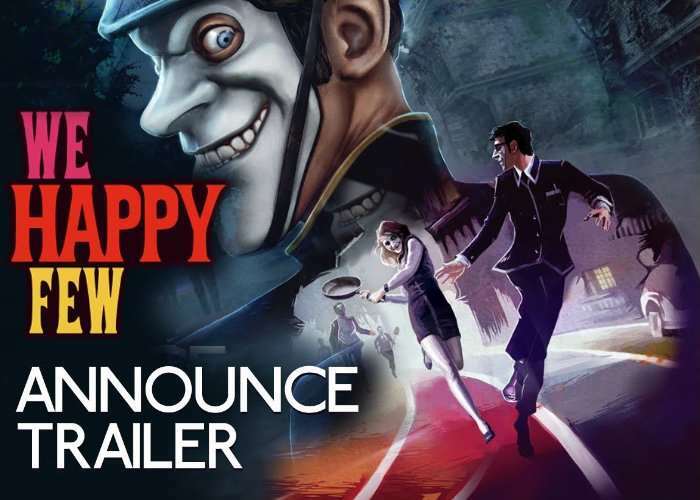 We Happy Few is a first-person action/adventure game that takes place in Wellington Wells, a little English town in an alternate 1960s timeline. There, the citizens block out their traumatic memories of the town’s past by taking “Joy,” a literal happy pill. We Happy Few has been influenced by similar media depicting dystopian societies, such as Brazil, Nineteen Eighty-Four, and Brave New World.Played from a first-person perspective, the game combines role-playing, survival, and light roguelike elements, with the developers focusing on creating a story with strong narratives, gameplay underlined by a sense of paranoia, and decisions having moral gray areas and weight that influence and affect later parts of the game.